The email went on to list all the details of the illegally downloaded game, when, where, and how it was downloaded, and advised us that further behaviour like this would result in us losing our internet. My youngest son had downloaded an illegal copy of Jak and Daxter. He tried to deny it at first. Then I told him I had received an email with all the details. So now he tried to justify it. His argument was sound, and one that, while I agree with his reasoning, is not recognized by the courts. But, unfortunately, it is an argument that many believe will protect them from civil suit. His argument was this. He had bought the disk a few years ago, when the game first came out. However, because games on CDs are not very durable, his game was no longer readable by the game system. He looked for a used copy at GameStop and tried to find a way to buy it online, but there was nothing available. He felt that since he had legally purchased the game originally, but could no longer play it, it was okay for him to download a free copy. He even tried to argue that this was his digital backup (which actually is a valid argument that I will discuss later). The issue here is that the courts have not recognized original legal ownership as a valid excuse for downloading through a Bit Torrent or peer2peer file sharing site. In addition, anytime you download from bit torrent or P2P sites, you risk infecting your computer with viruses. Note: bit torrent is the way files are shared through P2P, but I list them separately, as some sites call themselves bit torrent and some call themselves P2P. I want to make sure that students are aware that BOTH can be illegal. Based on what I have read, the argument about digital backup (Copyright FAQ) applies when you have a DVD or a CD that you make a copy of on your computer. Producers of music and videos use to try and prevent you from copying this material, stating it was to prevent piracy. Since then, it has been ruled that you have a legal right to make a backup (or archive) copy of media that you have purchased on a disk. In this case, it does not apply. If he had made a copy from his original disk, he would have been within his rights. But downloading an illegal copy from the internet is not protected under this rule. I am not a lawyer, but I do pay attention to this because I teach it. I do not necessarily agree with all of the laws, but it is not my place to argue the laws in the classroom. It is my job to teach the laws the way they apply, advise my students that it is always better to err on the side of caution, and if they don't like the laws, to go about changing them the right way. As educators and parents, it is our job to share this information with the youth in our care. 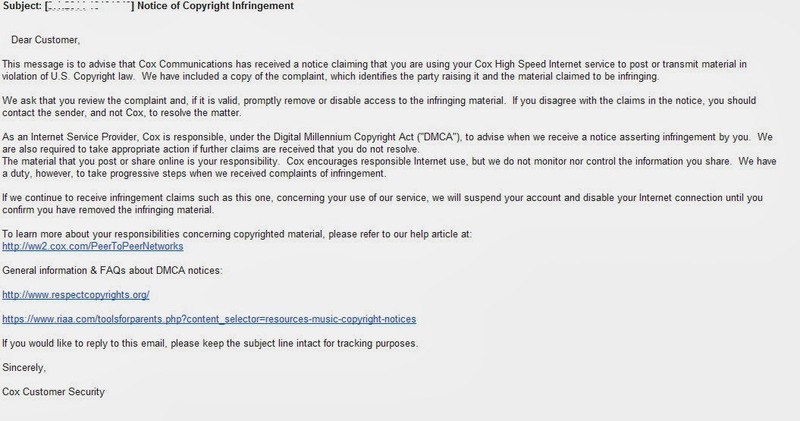 Google copyright infringement penalties sometime and see just how seriously the RIAA takes this and how many lives have been ruined over a few songs downloaded from a bit torrent or P2P site. Sharing copyrighted material is NOT allowed without the express permission of the copyright holder. In our digital world, where everything is immediately available, it is hard for many people to comprehend that just because it is on the internet does not mean it is legal. Most people would never walk into a store and steal a DVD, CD, or game. But when it's on the internet, the lines between right and wrong get fuzzy. Copyright is not a tangible thing in the digital world. Since we cannot hold it in our hands, it is harder for some people to make the connection with a real item to be sold for the benefit of the creator of that product. It is not always an easy topic to teach or comprehend (as shown by my son's challenges). But we must continue to teach our students that when someone creates something, it is theirs. They own it, and we do not have the right to access it and share out without fair compensation to the creator. Respect Copyrights written to appeal to those who have received a take down or copyright notice. RIAA Tools for Parents website by the people who actually pursue copyright infringers. Don't Be a Douche Yes, Jack Black says douche. But this is an entertaining way to explain why copyright law exists. BBC Story on Tracking Illegal Downloads this shows how tracking illegal downloaders has become an entire industry that is taken very seriously. Copyright Alert System article on CNET about how internet providers are tracking illegal downloads. Center for Media & Social Impact a great resource for all things copyright and fair use. Intended for college students, but the lessons work well with my HS students. Minnesota Woman Fined $220,000 for Illegal Downloads I have followed this story for years, she should have taken the original ruling of $30,000. Nintendo Copyright FAQ right from the horses mouth. How Nintendo feels about piracy. Ignorance of the law does not release the violator of those laws from the responsibility of their actions. With all of the articles, media, and sites out there dedicated to informing the public about copyright laws and an equal number dedicated to telling people how to get around the system, claiming ignorance would be pretty hard. We must do our best to teach our students and children what the laws are, but more importantly, why they exist and how illegal downloads hurt everyone.